Home > Skip Bins > Which skip bin is right for me? 15 Oct Which skip bin is right for me? Whether you’re working on a building project or you’re looking to clean up your home, skip bins will undoubtedly make the entire process far smoother. Not only will the skip bin keep your space clean and offer complete convenience, it will allow you to save time and money on that unwanted trip to the tip. For the best in skip bins in Western Sydney and the surrounding areas, we’re here to help. When it comes to skips, there are many different sizes that serve different purposes, so which bin should you choose? This guide will help you out. Before selecting a bin, there are two essential factors you should consider – the amount of rubbish you will be throwing away, and the kind of materials you will be throwing away. It’s also important to note that as long as you pack the rubbish into the bin in an intelligent way, you can probably fit a lot more than you think. The smaller bins are the 2m3 , the 3m3 and the 4m3. These skips are perfect for basic home clean ups, like clearing out your garage of old unwanted items. They’re also the perfect size for bathroom and kitchen renovations as well as green waste, so if you’re in the process of reinventing your house or yard, these bins are the best choice. The mid-sized category includes the 6m3 and the 8m3 bins. Both of these bins are perfect for most medium sized jobs, whether it be home renovation or smaller building projects. The 6m3 bin is the perfect size for moving materials like timber, as well as bulky furniture. The 8m3 bin can hold fairly large amounts of waste, be it heavy or light, and is usually perfect for most medium building sites. The larger skip bins in our arsenal are the 9m3 bin and the 10m3 bin. These are required for any large jobs. They’re perfect for jobs like big renovations and building projects, shop fit-outs and deceased estate clean-ups. They’re also the skips of choice when it comes to large tree removal and landscaping jobs such as stripping and returfing your lawn. With this information in mind, hopefully you can make an educated decision when it comes to hiring a skip bin. 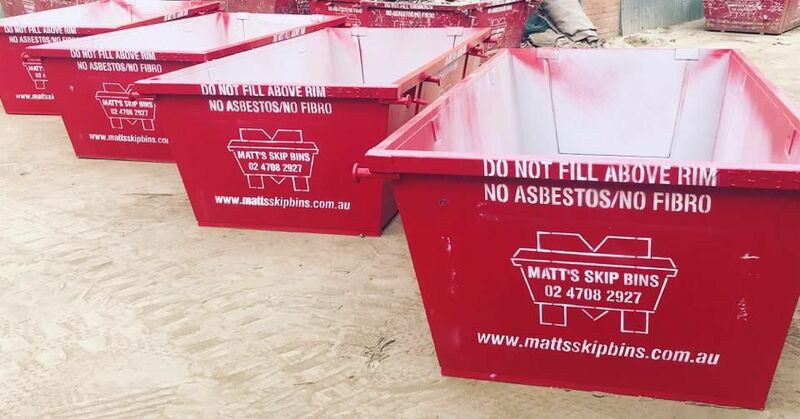 So, whether you’re after a construction skip, a general household skip bin or a green waste bin, we at Matt’s Skip Bins have got you covered. Give us a call today on 02 4708 2927 or book online at https://www.mattsskipbins.com.au/book-online.